When you're 40, gravity begins to take a toll on the old body. Irene is no exception. However, in true "can-do" fashion, I am going into battle with Father Time and have scheduled "the surgery." After all, what woman doesn't desire a pair of plump, smooth, curvaceous, perky earlobes? A victim of the '80s, my earlobes were stretched to the max by some heavy-duty earrings that looked like upholstery buttons. And I've suffered unsightly stretched out holes ever since. Granted, I will miss the party trick of being able to stick my entire finger through my earlobes, or the chuckle I'd elicit when insisting that my three children were birthed through my earlobes. But those jokes have grown stale, and I worry for my safety. I could easily get hung up on a branch or something. Irene is ready for a fresh young look! The surgery will be performed in late fall. It is done by my dermatologist in her office with a local anaesthetic. My lobes will be filleted and then stitched neatly back up. After four weeks I may elect to have them repierced. But for four weeks post-op I will be wearing heavy bandages that look like ear muffs. I think that will be grand for substitute teaching. I am always looking for a way to muffle classroom noise. "Do you remember sixth grade? Well, I do, because I was thrust into it for five consecutive days this week as a substitute teacher. It is everything you remember except you are 3 times bigger and smellier because you have been eating too much unorganic chicken & milk. On Wednesday, I brought some Febreze in with me. By some small miracle, both Smithers the class fish and I survived the week." O.K., friends. That was written back in February, so I apologize for the delay to print. Needless to say, I survived the sixth grade "experience" and here I am at the end of another school year. Yahoo! Bring on summer. I've had about enough of keeping up with prodding those little Cowboys into doing their homework, studying for SOLs, shuttling them to soccer & baseball practice. Enough! Fetch me a mint julep and call it a school year, will ya? So what's new w/you? I am mourning the end of Earl. It was a good run (four seasons!) but nevertheless, what is life without a weekly dose of Crab Man? And Joy? We hardly knew ye. Yes, my clever sibling can check "created emmy-winning sit-com" off his list and I'm sure he's on to bigger & better things, yet I pine for more trailer park shenanigans. Well, 40 actually. No matter. But the blogging...has it really been that long?? Gosh, I just joined Facebook and...well, eight months have elapsed. But I perused some of my old posts today and realize just how gifted of a writer I am, so I will no longer deprive you. I know that my readers have been hungry for Irene's wit for far too long. My big birthday approacheth, so if your card or gift (gifts are preferred over cards) is not in the mail, act fast. My neighborhood cronies threw me a most unique surprise party. A squaredance, complete with a professional caller! Nothing could have tickled me more. Not since fourth grade PE have I had the pleasure of promenading around a dance floor. Pure bliss. 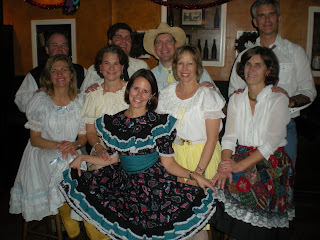 And she may be nearly 40 but, y'all, Irene can turn some heads in an authentic squaredance dress. Agreed? On Monday April 21, we said goodbye to a member of our family, Haley Hot Chocolate Stoker. She was a loyal and affectionate lab, fond of bacon, bagels, and cheese. In her youth, she was an excellent swimmer. She never met anyone, human or canine, she didn't like. Good old Haley Dog. Thank you for 13 years of companionship. We will all miss you. Hello friends! Ah, spring has sprung and Irene is lumbering out of hibernation. How are ye? I know it's been awhile and I apologize. You know how life can be so Z*a*N*y. No doubt you have missed hearing of the antics of Irene and family. I think we left off somewhere around Owen Wilson's personal tragedy... Well, let me get you up to speed. We had a nice winter. Spent the yuletide in town but had a nice long weekend ski getaway with aunts, uncles, and cousins. Had a fabulous weekend with high school friends in NYC... Hmmm. What else? Busy heading up the chess club, and glad to report it is almost over for the year. Sing "glory, glory" for that. Sad to report that Haley Dog is failing. I feel as if I've been saying "it won't be long" for months, but she is a determined old sack of fur and bones. Despite her chronic weight loss, she continues to have a ravenous appetite for cuisine of all types. However, we all know she cannot survive much longer weighing no more than a guinea pig. and Happy Passover to my Jewish homies. 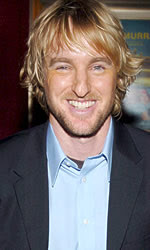 I am despondent over the news of Owen Wilson's suicide attempt, who happens to be one of my favorite men, after the agile monkey. Was he feeling poorly about his nose? Last weekend, I completed my fourth sprint triathlon (a personal best for Irene!) Once again I was made painfully aware of my odd running style. At the party after the event, I was telling a fellow triathlete that "I run funny." I was fishing for a "Oh, no you don't!" or a "Don't be silly!" Instead, without hestitation, she remarked that I seem to move my body more than necessary, and even went so far as to suggest that I appear to be doing a breaststroke kick as I run. Up until then, I was feeling pretty good about my performance!